In October 2017, we highlighted the buzz and activity in Birmingham’s Central Business District and discussed the specific trends that were driving growth in this area of downtown. At the time, the emergence of the historic renovation tax credit was a key factor to much of the new and upcoming developments, including the Pizitz Building, the Historic Federal Reserve Building and increased activity along 1st Avenue and 2nd Avenue North. 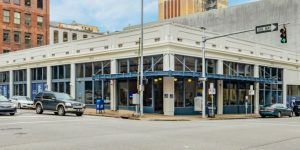 Most importantly, this period of growth reflected the bright potential for downtown Birmingham as the city continued its revitalization efforts. Today, much of that potential has been realized, as the CBD’s rapid growth and transformation continues. With several notable transactions that have recently taken place and a foundation to capitalize on upcoming opportunities, the district represents a bright spot in the city’s future. As we prepare to capitalize on this pivotal time in our city’s development, we continually assess recent, upcoming and potential transactions to gauge the future of Birmingham’s CRE market. One trend we’ve identified in the local market is the increased demand for brick-and-beam space, particularly for smaller properties that range between 1,000 and 3,000 square feet. These modern office spaces provide tenants a look and feel that is attractive to young talent – a demographic that is a recruitment priority for many companies today. Jefferson Corner, however, is one property that is meeting this demand. The newly renovated office and retail space is located in the heart of downtown Birmingham and features high visibility along well-travelled streets. With an open and flexible floor plan and close proximity to parking, the space offers features and amenities that provide significant workplace benefits. 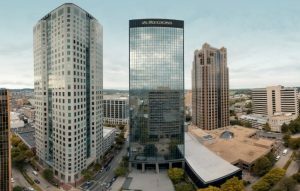 You’ve likely heard that the Wells Fargo Tower will become Shipt Tower in 2020, representing one of the more significant developments for Birmingham’s urban core over the last few years. The Birmingham-based startup acquired naming rights to the tower, one of the largest in the city, as well as 60,000 square feet of space in a transaction that is set to pump even more CRE energy into this growth-friendly area. Perhaps more importantly, the success that Shipt has enjoyed should serve as a sign of confidence for other startups in the Birmingham area that the city is conducive to business growth. Beyond the Shipt transaction, there are several other factors to watch in this area of the CBD, including the future of the vacant AT&T headquarters that was purchased in March of 2018 by Connecticut-based VCP City Center. VCP has plans to redevelop the 30-story building into some combination of residential, restaurant and office space, although no specifics have been announced. Another factor is the continued construction improvements to the I-20/I-59 interstate connection. Many CRE professionals need to be prepared to assure potential tenants that the construction is no reason for hesitation to move their operations into the area. As the central business district continues its growth, properties throughout the area will become increasingly desirable for their proximity to these newest developments. Look no further than the space at 2317 3rd Avenue North. This building provides high-growth companies with 33,600 square feet of ideal space in one of downtown’s most bustling neighborhoods. The property’s high ceilings, open floor plan and brick-and-beam interior are complemented by on-site parking and proximity to the restaurants and attractions along 2nd Avenue North. As this area of downtown continues to grow in popularity, we expect adaptive reuse to play a key role in creating highly desirable spaces in the area. There’s no denying that Birmingham’s Central Business District has made significant progress in growth and revitalization over the past few years. However, with upcoming properties and projects, as well as the trends that point to continued growth, the best may be yet to come. Check back soon as we continue to highlight other areas of recent growth within Birmingham’s CRE market. In the meantime, learn more about the activity in the city’s Southside district from Project Manager Will Hollingsworth.